T-61 German Tier VI Destroyer. Designed as an average-sized destroyer, her design was officially known as Flotten Torpedoboot 1940. This series of ships were built in the Netherlands based on Dutch designs and components. It differed favorably from other same-type German ships by its overall well-balanced combat features. GBP - 18.22. inc Port Slot; Special Challenge: Х3 XP For 25 Battles. Please Note: Doubloon cost is precise, therefore currency costs are based on the Doubloons - GBP Exchange, and may differ slightly for different countries. Plating - 8 ~ 16 mm. 4 X 1 128 mm L/45 LC/34. Firing range – 11.64 km. Maximum HE shell damage – 1500. Maximum AP shell damage - 3000. HE initial velocity - 830 m/s. AP initial velocity - 830m/s. 2 X 4 533 mm Vierling. 4 X 4 20 mm Flakvierling 38. 2 X 2 37 mm Flak LM/42. Turning circle radius - 600 m.
Surface detectability – 6.79 km. Detectability after firing main guns in smoke – 2.63 km. 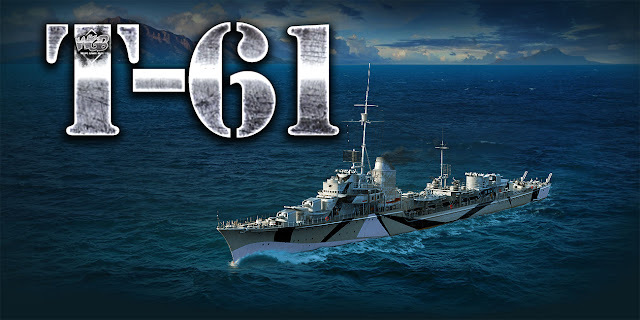 T-61 is similar to her Tier VI tech tree counterpart Ernst Gaede. Both ships share the same the same 128mm main batteries and the same torpedoes. They also have access to Hydroacoustic Search (While active, detects all enemy ships and torpedoes within the specified radius, regardless of obstacles (such as smoke screens or islands). ), being the only destroyers at Tier VI to have this consumable. These two factors make both ships very good in close range combat and ambushing enemies in smoke screens. However, T-61 has main batteries that fire slightly faster than Ernst Gaede’s, giving the firepower edge to T-61. Unlike Ernst Gaede though, T-61 does not get access to the 150mm main battery guns. Besides main battery performance, the T-61 can also perform the role of torpedo boat superbly. She has a torpedo range of 8.0 km and has a surface detectability range of 6.8 km without the commander skill Concealment Expert. With this skill, her detection range goes down to 6.1 km, giving her plenty of space to torpedo enemies from beyond her detection range. T-61’s detection range is also lower than the Ernst Gaede's minimum surface detectability range of 6.6 km, a significant reduction in detection. Additionally, T-61 has a very quick torpedo reload time at 68 seconds, over 20 seconds better than the torpedo reload time of Ernst Gaede. T-61 is overall a stealthier, more torpedo-centric version of Ernst Gaede. Although her main battery rate of fire is faster, T-61 lacks access to the 150mm guns that Ernst Gaede can use to punish enemies with high damage shots.